Esmerelda the pet boa constrictor. Two teenagers accused of causing “unnecessary suffering” to a pet snake, which later died, have denied the charges against them and will stand trial next year. Frankie Kane, 19, and her 18-year-old friend Yasmin Doherty appeared at Aberdeen Sheriff Court today to answer a single charge relating the mistreatment of a three-year-old boa constrictor. The pair are alleged to have abused the pet, named Esmerelda, after it escaped from its home and they discovered it on Marischal Court on Wednesday, July 4. Court papers claim that they caused the protected animal “unnecessary suffering” while “reasonably knowing” their actions would have that effect. Prosecutors allege that Kane and Doherty “seized the snake by the body, spun it around and threw it, whereby the said snake suffered injury”. The pair both pleaded not guilty, and a trial has been arranged to begin in February. Kane’s address was given as Printfield Walk in Aberdeen, while Doherty lives at Marischal Court. In the aftermath of the alleged incident in July, video footage appearing to show the snake being mistreated emerged online. 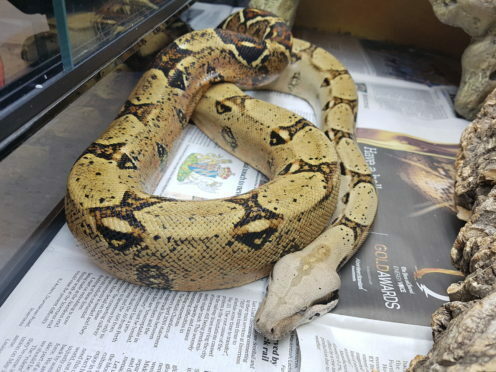 Police at the time said the reptile had been handed into its Queen Street office by a member of the public, who had found it in the street. The pet was sent to the Scottish SPCA’s Drumoak rescue centre to recover, but died there hours after being handed in. Owner Robert Norman discovered his companion had vanished when he returned to his flat on the night in question. Mr Norman, who lives at Marischal Court, presumed that the boa escaped through his open bedroom window and had gone down to the street below. He said: “I’d been out for a walk on Tuesday evening, and came back to find Esmerelda wasn’t in her cage.